We had a wonderful evening last night, in the company of two Very romantic…. or not, considering our “cenone” menu: salmon on toast appetizers, Stefano’s pasta with ricotta added to make it extra special and for dessert…. 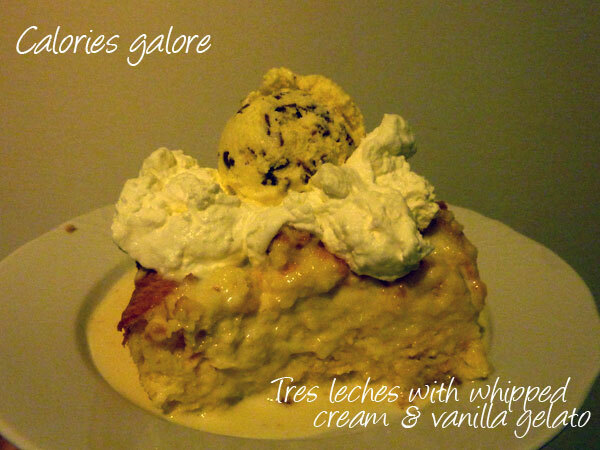 tres leches cake AND homemade vanilla stracciatella gelato!! Yeah, know what you’re thinking…. way too much, so before proceeding to dessert, we went out for a walk downtown to be out around midnight. 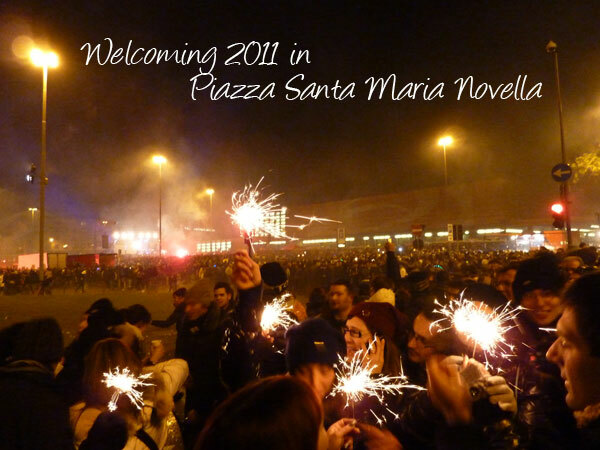 In Florence, the city planned music in the squares to provide the public entertainment to welcome in 2011. The main event was in front of Santa Maria Novella with Elio e le Storie Tese, an Italian music group that is hard to describe – alternative? Another square had classical music, another music from the past decades and another gospel music. We decided just to head out and see along the way where we might head and ended up at midnight at an edge of Piazza Santa Maria Novella. The stage was far and the square very crowded. We weren’t going to head further in. As luck would have it, we were right next to this circular grassy patch that normally moves traffic along, last night it was where everyone was launching fireworks from. That can get really loud. People were carrying around bottles of spumante and plastic cups, after they finished the bottles (half of the contents ending all over people rather than in cups), they started throwing them on the ground to watch them break up into little pieces. Time to get moving back toward home. 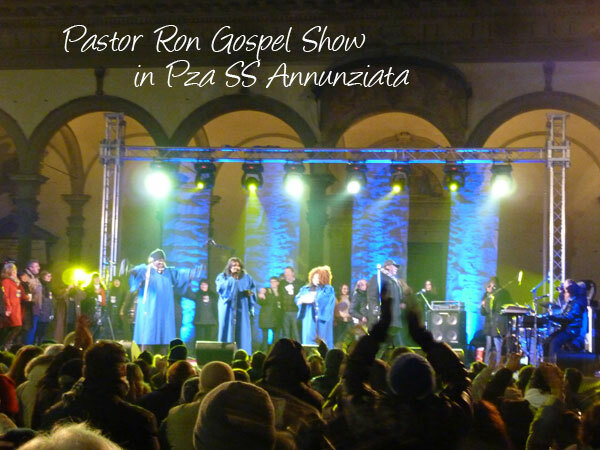 On the way back we take the route that takes us past Piazza Santissima Annunziata which is where the gospel music is being offered. As we near the group start singing “Lean on Me” so we definitely stop to listen. The piazza is less crowded, people are listening to the music and doing a little bit of dancing. There are no drunks to be seen yet, a very good thing. So we ended up staying until the end of the concert around 1am, really enjoying the music and atmosphere in the square. We then headed home to tackle dessert as we watch a movie! Yum, yum! 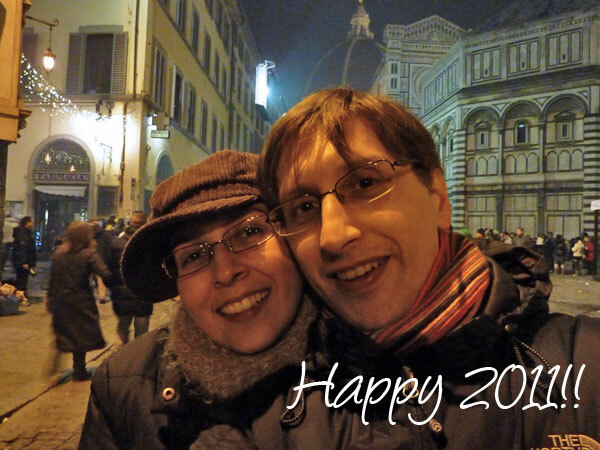 A very good 2011 to everyone!! Mine starts with a short run, better than nothing!